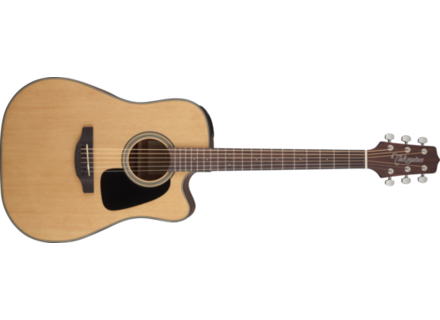 GD10CE-NS, Dreadnought Steel String Guitar from Takamine in the G10 series. Very well built for that price range. Of course, I’m not comparing it with a €1000+ model, but for an instrument under the €400 mark you get a great-looking, well-built, sturdy instrument – plus, for the price, it’s an electric-acoustic, which in my opinion makes all the difference. The Takamine neck is comfortable and pleasant to play. The cutaway allows for easy access to the lower part of the neck. Its acoustic sound is well-balanced with great lows and a great projection quality (it’s a dreadnought). When plugged on a good electric-acoustic amp, it becomes really surprising. The sound is natural and true to the original, plus it’s really punchy. The preamp perfectly does the job. It’s very easy to use, the right setting is easily found and the sound is pleasant – a real, good surprise. The guitar stays very well in tune, and the onboard preamp features a rather practical integrated tuner. Perfect for all users including beginners and those doing the jump from a nylon-stringed guitar to a folk model, it can also be used as a spare guitar and will go anywhere – to the beach, to parties, basically everywhere an experienced player would be reluctant to bring the jewel of a guitar he paid very, very much more for. It can easily be found used but mint for under €250, and an electric-acoustic in such a price range really offers an unbeatable value-for-money.